Hilltop Greenhouse and Farm has been dedicated to delivering its customers the best quality plants and vegetables for over 25years. Glenn, Gretchen, and their three daughters began with one small greenhouse to startvegetable transplants for the field; we have grown into a full service Garden Center and source for local, home grown farm fresh vegetables. As word of the selection, quality, and knowledgeable customer service spread, our greenhouses and fresh vegetable production expanded. 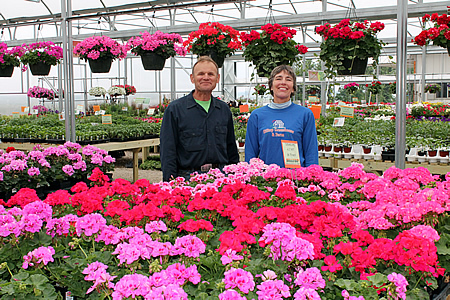 Glenn and Gretchen come from farming and greenhouse families active in growing local plants and produce today. Not only do we have practical experience in growing but also keep up to date with the best practices to produce our products. At Hilltop Greenhouse and Farm all our plants are propagated here at our greenhouse. We control the quality from the start to provide a strong, healthy product. June 2010 tornadoes change the landscape of our business and having to rebuild from scratch will be a challenge. Plans for a new retail greenhouse have begun and customers will be delighted with the new design. Hilltop Greenhouse and Farm is dedicated to providing our customers with consistent, high-quality plants and vegetables. We are the perfect size to pay close attention to every detail from starting the seed to helping a customer pick the perfect plant. Attention to detail is why our customers return year after year. We take pride in the fact that every plant and vegetable is inspected for quality, as our reputation was built on superiority!